01What is blepharoptosis correction(corrective eyelid surgery)? A recent study has revealed that nearly 68% of Korean women lack the double-eyelid feature, along with possessing the smallest eyes among all ethnic groups worldwide. Simply explained, the ptosis correction procedure produces an aesthetically clear improvement in eye shape and size. Although position of eyelid has to be hung up in 1-2mm to the pupil, but when ptosis is severe, then eyelid covers the pupil. It is also common that ptosis is made in only one side and it makes eyes looked as an odd pair. Medically speaking, a blepharoptosis correction can be applied to strengthen the levator muscles required to increase the vertical exposure amount of the eye and visual clarity. However, the medical terminology ‘blepharoptosis’ is used more specifically to treat those who experience moderate to severe conditions involving actual eye functionality and performance. The term ‘corrective eyelid surgery’ is more commonly used among those of Asian ethnicity seeking cosmetic improvements for brighter looking eyes. It is a relatively common occurrence in the Asian population to see cases where a patient’s upper eyelash or eyeline covers about 2-3mm of the upper corneal margin due to slight ptosis. For those who lack strength in their eyes, conventional double eyelid surgery alone is no longer adequate in increasing the amount of its exposure, shape and size. Until now, undergoing ptosis correction to reinforce the function of the levator muscle, in conjunction with incisional double eyelid surgery, has produced the greatest possible cosmetic result. while incisional surgery was the only solution available in the past, the introduction of non-incisional ptosis correction (2010) will begin a new era of minimal-invasive procedures with no scarring and quick recovery time. 02What is non-incisional ptosis correction? 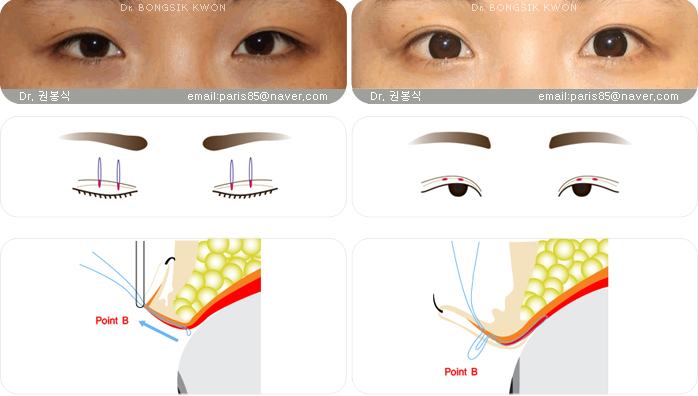 VividEye surgery - Functional and structural non-incisional double eyelid surgery with ptosis correction ? This new ptosis correction procedure was introduced in 2010, and just like its name, is performed without using any incisions. Teuim Plastic Surgery Clinic has developed its own method to supplement double-eyelid surgery with the non-incisional ptosis correction procedure VividEye, which has been especially tuned for Korean or other similar ethnic groups to deliver the most aesthetically pleasing results. 1. Caucasion individuals have a natural double eyelid feature because part of their levator muscle is connected to a piece of skin underneath the upper eyelid. Korean people, however, have several characteristics that prevent the formation of a double eyelid crease; the orbicularis muscle behind the upper eyelid skin is too thick, the orbital fat sags too low, or mostly importantly, there is too much tension in their Mongolian folds. 2. The orbicularis muscle surrounding the eye serves an important function of allowing individuals to close their eyelids. 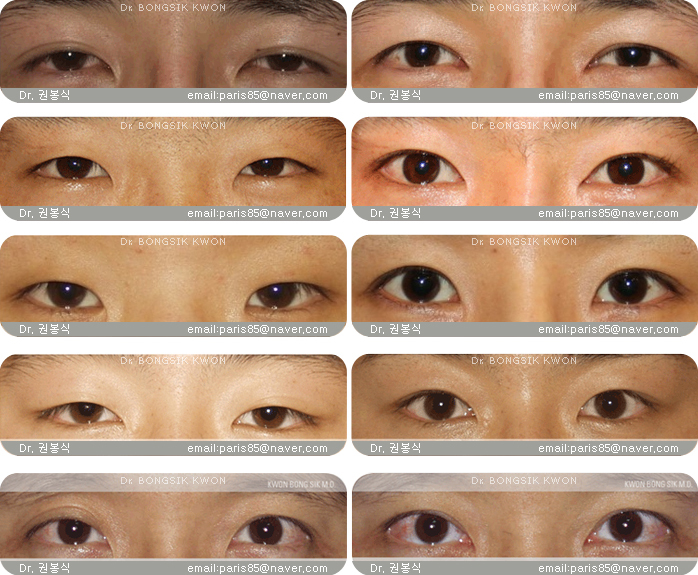 Korean people have more prominently developed orbicularis muscles, and have particularly thick fibrous bands in the inner corners of their eyes, creating the Mongolian folds. These folds make it difficult for eyes to open completely and also prevents the formation of double eyelid creases. Furthermore, while double eyelid creases lie along a horizontal vector of the eye, they are counteracted by the tension created by Mongolian folds, causing surgically created double eyelid creases to unravel. 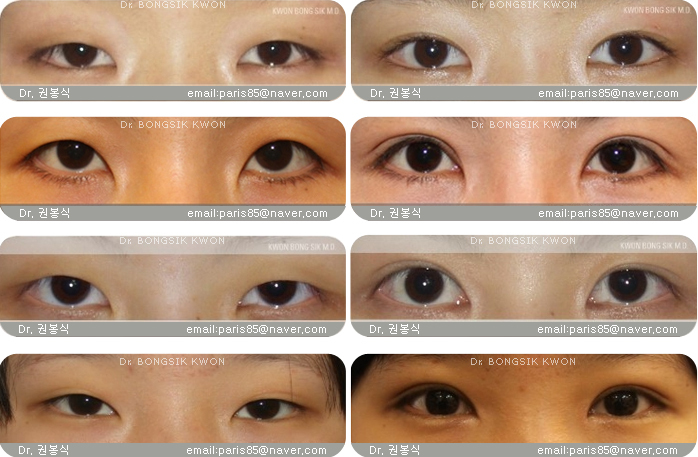 Korean people cannot be subject to the same methods of double eyelid surgery used on the caucasian people. In other words, because the majority of Japanese people and south asian people are considered as Southern Mongoloids with weak tension in their orbicularis muscles, Korean people, catergorized as Northern Mongoloid, cannot be subject to the same surgical methods, because they would experience inconsistent results. Taking into consideration the structural differences between Korean (Asians) and other races, the Teium Plastic Surgery Clinic has modified the surgical method and created VividEye to ensure the best possible results for those undergoing the eye procedure. 03Who is eligible for VividEye? Those who are eligible for non-incisional double eyelid surgery, but also suffer from mild ptosis. In the past, all ptosis corrections have required the use of incisions, but VividEye provides both non-incisional double eyelid formation and non-incisional ptosis corrections. Those who have natural double eye lids but drowsy looking eyes. Males who wish to increase the vertical size or exposure of their eyes without having heavily defined double eyelid creases. 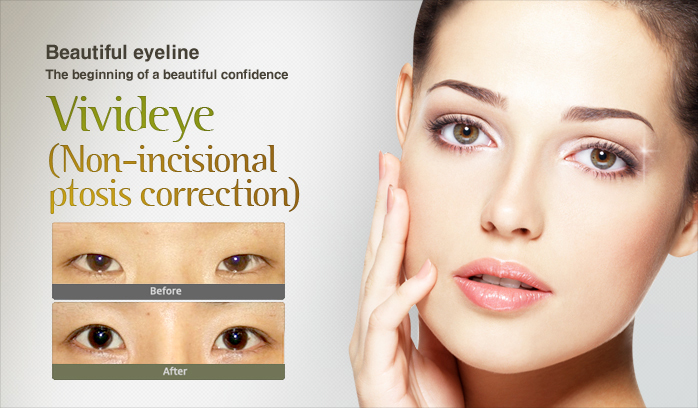 Those who are unsatisfied with a previous incisional ptosis correction. Patient suffered from a severe degree of ptosis. A Magic epicanthoplasty with VividEye can correct these cases. 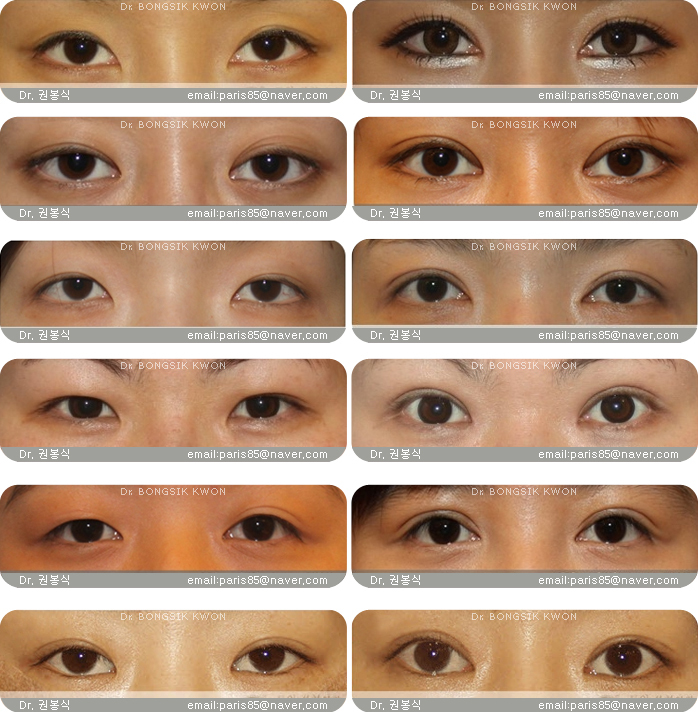 For making paralell (out-fold type) double eyelid, vivid eye surgery is helpful in some cases. Avoid touching or rubbing your eyes for three to four weeks due to the chance of loosening buried stitches. Those who have undergone vision or laser eye corrective surgery should wait for about three months before electing to have VividEye. Am I eligible for VividEye if I suffer from a severe case of ptosis? Severe cases of ptosis can be due to congenital reasons or levator dehiscence and can lead to unsatisfactory results from VividEye. This could be different the case of Muller type ptosis, no matter how severe. In any event, we recommend that you come in for a face to face consultation if you are considering VividEye. Is it as simple as non-incisional double eyelid surgery? VividEye is similar, but requires more surgery time as it is a bit more involved. Recovery time however, is similar to conventional non-incisional double eyelid surgery. Will VividEye allow me to choose the height of the double eyelid crease? Yes, you can choose where you wish to have your double eyelid crease to be located. How much recovery time will I need after VividEye? When undergoing incisional ptosis correction, it takes about two weeks for major surgical swelling to subside. However, you should expect to recover from major swelling in just a week after VividEye. Do I need to worry about my double eyelid crease unraveling or becoming loose after surgery? Even incisional double eyelid surgery with ptosis corrections carry some risk of becoming loose or unraveled after surgery, and VividEye has a similar potential. However, corrective or revisional surgeries in those cases are much easier and simpler for VividEye. I am a male who is not interested in having the double eyelid crease, and do not want it to be obvious that I have had surgery. What can VividEye do for me? One of the great advantages of VividEye is that it does not have strict requirements for males. Although VividEye cannot avoid the double eyelid crease completely, it can be minimized to be barely visible. I have had incisional double eyelid surgery with ptosis correction in the past, but I am unsatisfied with the results. Instead of revisional surgery, should I just elect for VividEye? In the absence of any major scarring or adhesions, we recommend that you come in for a consultation so that we can see what VividEye can do for you. Examples) Patient had incisional double eyelid surgery in the past but did not undergo ptosis correction, still suffering from moderate degree of ptosis. VividEye surgery has corrected this problem. Examples) Patient suffered from a moderate degree of ptosis. A Magic epicanthoplasty with VividEye has corrected this problem. Examples) Patient had non-incisional double eyelid surgery in the past but experienced loosening of her double eyelid creases. A Magic epicanthoplasty with VividEye has corrected this problem. Examples) Patient suffered from a mild degree of ptosis. A Magic epicanthoplasty with VividEye has corrected this problem. Examples) Patient suffered from a moderate degree of ptosis, along with sclera show. A Magic epicanthoplasty with VividEye has corrected this problem. 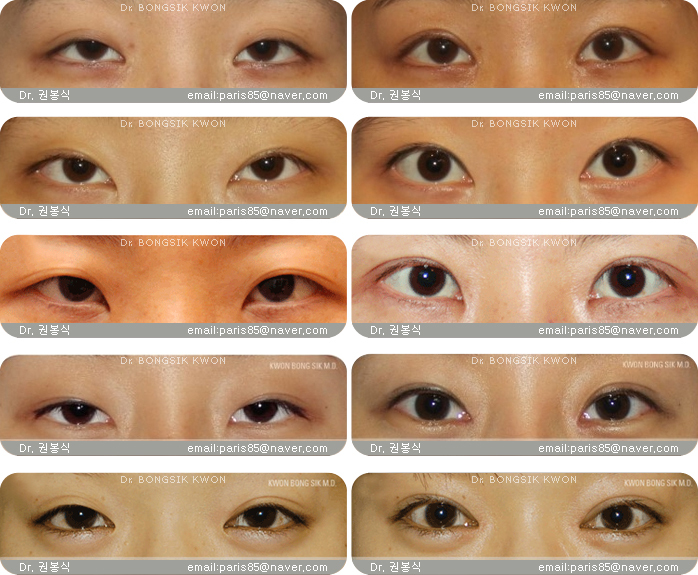 Examples) Patient had different double eyelid crease , and asymmetric ptosis . VivvidEye surgery has corrected this problem.